Mill-Max introduces our lowest profile spring-loaded connectors, just .100" in height. The trend toward miniaturization in electronic packaging demands ever smaller interconnects that deliver high quality performance. 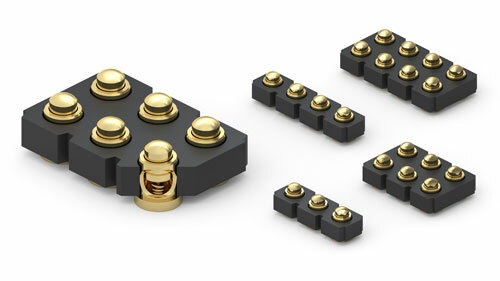 For board-to-board or device-to-board connections, these low profile spring-loaded connectors are a practical solution. These low profile spring-loaded connector options maintain the quality and reliability of current Mill-Max spring pin connectors by utilizing the same technology & internal spring components. Gold-plated components and springs ensure the highest conductivity, corrosion resistance and durability. The spring- loaded pins used in these connectors are rated for one million cycles and have a current rating of 2 amps continuous use (3 amps maximum.) The high temperature plastic housing is suitable for all soldering processes and the connectors are RoHS compliant.